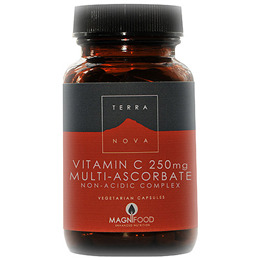 TERRANOVA Vitamin C 250mg Complex enhanced with highly active, whole and unadulterated superfoods and botanicals. Vitamin C is a potent antioxidant that helps protect tissue against the potentially damaging effects of free radicals. SRB contains more than 100 known antioxidants. This list includes tocotrienols, tocopherols and alphalipoic acid, which recycle oxidised vitamin C in addition to their own free radical scavenging activity. Sea buckthorn berries are a potent source of vitamin C and flavonoids (a category of plant pigments which includes various compounds that enhance the activity and function of vitamin C). The berries are also rich in vitamin E, which is known to recycle oxidised vitamin C within the body. Both the berries and leaves contain a wide array of antioxidant compounds that generally complement the properties of vitamin C.
Acerola is renowned as one of the most potent sources of vitamin C - for example, acerola juice has been shown to contain 30 times more vitamin C than orange juice. This Caribbean fruit also supplies significant amounts of complementary antioxidant polyphenols such as proanthocyanidins and cyanidin-3-o-rhamnosides, as well as a high concentration of carotenoids. Like sea buckthorn, acai berries contain a wide variety of antioxidants that generally complement vitamin C. Most notable are flavonoids such as anthocyanins, and vitamin E - which is known to recycle oxidised vitamin C.
With a concentration more than 100 times that of oranges, rose hips are one of nature`s richest sources of vitamin C. Rose hips also provide complementary antioxidant polyphenols such as anthocyanins and proanthocyanidins, as well as several carotenoids. Each Terranova nutritional product is enhanced with its own synergistic complex of botanicals and phytonutrient-rich foods, called Magnifood. Magnifood ingredients are combined in a manner that enhance the body`s biochemical environment in order to maximise the potential benefits of the product`s vitamins, minerals and/or other nutrients. Many of the plants used in Magnifood are fresh freeze dried. Research shows that fresh freeze drying has the unique ability to retain a plant`s enzymes, and is shown to be superior to other drying methods in terms of activity, stability, solubility and preservation of a plant`s original fresh chemistry (as it was when the plant was harvested). Protecting ingredients from oxidative damage - helping to support the stability and activity of the product`s nutrients. Below are reviews of TERRANOVA Vitamin C 250mg Complex - 100 Vegicaps by bodykind customers. If you have tried this product we'd love to hear what you think so please leave a review. I have not had any colds since using this product, my skin is much better, and all natural, will be buying again. Excellent product. Since using these tablets my immune system is stronger. I also have clearer and brighter skin; something which I have been striving for, for a long time with no avail. Thank you Terranova for producing such a superior product. TERRANOVA Vitamin C 250mg Complex enhanced with highly active, whole and unadulterated superfoods and botanicals. Vitamin C is a potent antioxidant which helps protect tissue against the potentially damaging effects of free radicals.